I seem to be on a quilting kick lately. I don’t usually like to work on stuff like that when it’s hot because, well, it’s hot. All that fabric in your lap is like wearing an unnecessary blanket. But sometimes things have to get done. I actually made this little mat to include in my daughter’s Map Memory Box to take to college. The dorm she’s moving into is only a couple of years old, so I thought the furniture deserved a little protection from her tea cups. To make this little mat, you’ll need this pattern. Cut the pattern pieces apart. 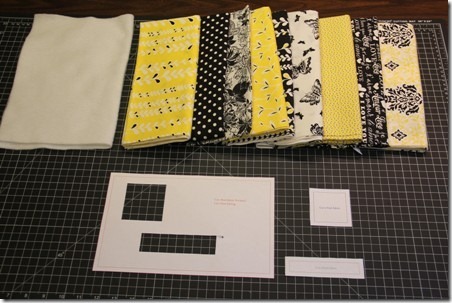 Cut 9 small squares from cotton fabric, 9 strips from cotton fabric, one large rectangle from cotton fabric for backing and two large rectangles from cotton batting. You can use just one layer of batting if you prefer it a bit thinner. 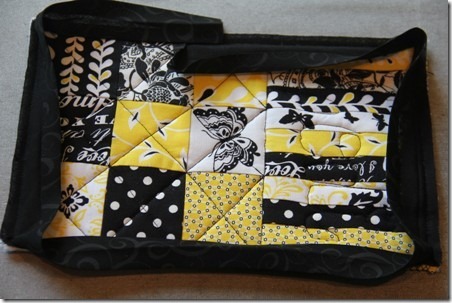 You’ll also need about a yard of bias tape to fit around the outside edge. Sew the strips together as shown. 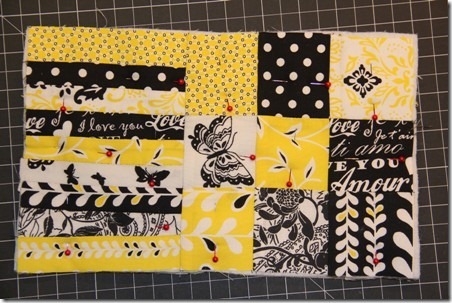 Sew the squares into three rows of three, then stitch those together to make a square. 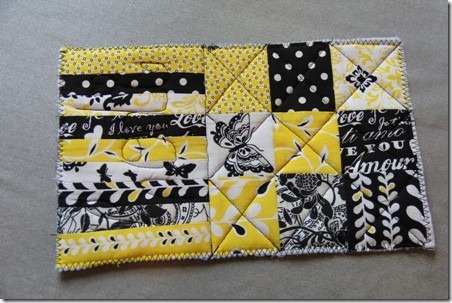 Stitch the strips and square together. Layer the backing wrong side up, the cotton batting, then the strips and squares right side up. Stitch through all layers in whatever pattern you’d like. I went with a diagonal through the squares, but stitched Codi’s name over the strips. Don’t look too close at that. I also did a zigzag stitch around the outer edge. Open one edge of the bias tape and pin the edge to the edge of the mat. Fold the beginning end under about 1/4” and overlap that with the finishing end. Stitch in the opened fold, all the way around. Fold the bias over the edge to the back. I intentionally used wide bias which would fold deeper onto the back. I thought it fit with the Batman fabric. I also stitched it in place by hand…which I almost never do, but it was worth it. Now, I’ll just keep deluding myself into believing she’s actually going to use it, rather than create rings on that poor furniture.